i-genius first met with Happy Healthy Human Founder, Samantha Attard at the 2015 3rd Global Healthy Workplace Summit and Awards in Florianopolis, Brazil. 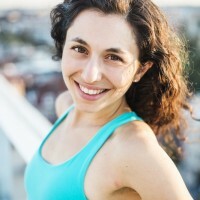 Samantha Attard teaches ambitious adults how to navigate their diets and daily lives with less stress and more ease. As well-being is core to everything we do here at i-genius, we decided to find out more about HHH. i-genius: From idea to actualisation. How was the idea for HHH first born and how did you turn it into a reality? Samantha Attard: My idea for HHH started in January 2014, but it’s roots go much further than that. I was working on my PhD in Nutrition at University of North Carolina at Chapel Hill, and I realized that the majority of health and nutrition initiatives fail to take into account individual differences in needs and preferences. I saw that public health was telling people to “lose weight” or “eat healthy”, without providing realistic, actionable tools to make that possible. After spending years researching and learning about nutrition traditions from around the globe, as well as experimenting with tons of different diets on myself, I decided that people needed access to scientifically-proven strategies to help them eat healthier, as well as blue prints to help them actually implement those strategies in to their busy days. I melded my knowledge about nutrition with my passion for yoga and mindfulness to offer holistic wellness coaching to my clients. As for turning it into reality, I bought a domain name, secretly started writing on my blog, and eventually began telling the world! i-genius: What have been some of your failures, and what have you learned from them? Samantha: Oh gosh, there have been a lot of failures along the way. There have been products that have been launched and no one has bought. Unfinished e-books. Partnerships that seemed like a sure thing until the last minute. I’ve learned that no one failure makes or breaks your business. And, it’s only a failure if you define it that way. I prefer to mark success in the effort I’ve put forth and the people I’ve reached. If I’m sticking to my standards, my mission, and putting my all into what I’m doing – it’s a success. i-genius: What makes HHH unique compared to your competitors? Samantha: HHH is unique in that I’m not trying to sell one SPECIFIC way for you to get healthy. Everything I’ve learned over the years points to the fact that we all have different nutritional needs, preferences, and schedules. Trying to fit everyone into one mold is a disservice to the person. That’s why I offer customized solutions for my clients, so that at the end of the day, I’m serving them, not just trying to sell them a specific ideology. i-genius: Tell us more about your FREE meditation sessions and why they’re free? Samantha: I’d love to! I’ve been meditating regularly for many years, and I’ve seen how it’s literally transformed my brain. Meditation helps me feel more calm, more focused, and more in touch with myself and my inner wisdom. I wanted to share this with others, but I know that the idea of meditating can be daunting, both because people don’t know how to meditate, and because they don’t think they have time. That’s why I started recording 3-minute meditations that are casual and approachable, but still gives you all of the benefits of meditating. I put some together as a 30-day introduction [link http://samanthaattard.us8.list-manage.com/subscribe?u=7a40f7128aed03c5cc3a706fc&id=8b0cd9ec20], so you can get started one day at a time. The response has been amazing! People have been amazed at how quickly 3 minutes goes, and how they’re already starting to feel calmer and happier after 6 or 7 days. Why free? Because we all could use a few minutes of quiet in this very noisy world. How have you built a successful customer base? Samantha: I’ve gotten customers from a few different avenues. First is referrals – everyone has someone in their life who has been dieting unsuccessfully for many years, is feeling tired and overworked, or knows that they could feel better than they do. More recently, I’ve been getting more clients through Periscope (Periscope.tv/happyhealthysam). I do broadcasts about nutrition and wellness and we’ve built an amazing community of people who are interested in living their best life! Lastly, I get clients through my speaking engagements and workshops. I love to talk with groups about nutrition, productivity, and goal setting. i-genius: How do you define/measure the success of HHH? Samantha: I measure success in reach. Not because I want to have one million instagram followers, or be the most popular person, but because I know that the more people I’m reaching, the more people I’m serving. When a reader or client tells me that something I’ve taught them has improved their day, their body, or their life….I am filled with happiness and pride. That is why I’m here, that’s the reason I do what I do, and I find it so incredibly satisfying. i-genius: Excluding your own. What company/business do you admire most and why? Samantha: I admire Marie Forleo (Marieforleo.com). She has built an amazing brand while being unapologetically Marie. She has introduced a model of entrepreneurship that ties charitable giving to every product she sells. She sells with heart and with goodness. I admire NextJump. Their a tech company based in NYC, and they treat their employees so incredibly well. They spend weeks training each employee not only on the business, but also in personal development. They have a weekly ritual where they all get together and thank another team member for something they did that week. It’s an amazing way of doing business, and I love that they treat their employees as individual, whole people, not just employees. i-genius: In one word, characterise your life as an entrepreneur. Samantha: Vulnerable. What I wasn’t expecting about starting a business was truly putting myself out there day after day. I’ve done so many things that I would have been scared to do – flying to other cities for video shoots, speaking in front of hundreds of people, and really sharing with the world my philosophy about food and life. It’s trying at times, but I love that I do better as an entrepreneur when I am totally transparent, honest, and myself. That ability is truly a gift. This interview was conducted as part of the i-genius ‘Innovation, Business Start-Up and Wellbeing’ interview series. If you would like to develop a particular aspect of your business or address something you are struggling with, then why not take our ‘Social Entrepreneur and Business mentoring’ sessions with i-genius Academy. To find out more, click here!